As Adam Driver breaks out of his oddly-endearing-but-also-kind-of-a-jerk Girls heartthrob role and delves into movie star status with his turn as Kylo Ren in Star Wars: The Force Awakens, there is no doubt in anyone's minds that his star is rising — and fast. And as things heat up for the actor and his career, one solid constant in his ever-changing life is his wife, Joanne Tucker. 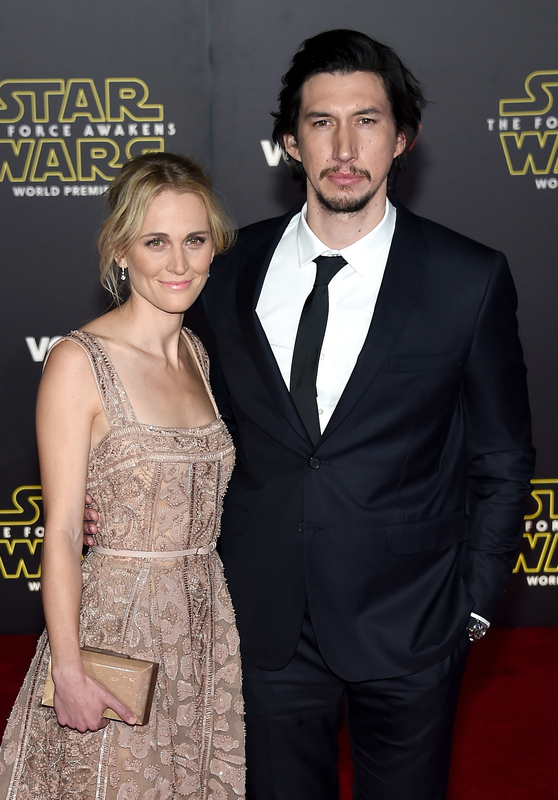 Tucker, an actor in her own right, has been a constant fixture on The Force Awakens red carpets, supporting her husband as he navigates the press and promo of his biggest project to date. And despite the couple's complete (some may say refreshing) lack of social media, Adam Driver and Joanne Tucker's cutest moments are certainly some for the books. Though fans can't exactly expect Tucker and Driver to be selfie-ing it all over the Internet just yet (the lack of Twitter and Instagram accounts makes this almost impossible), they're clearly the type of couple who can be straight-up adorable without flaunting it all over the place in attempts to make their followers jealous. In fact, Tucker and Driver (who had been together for years before getting married in 2013) do a pretty damn good job of being envy-inducingly precious just by living their lives. Just see the following for proof. More like The Happiness Awakens, amirite? OK, that was terrible, but this red carpet moment is pretty darn smiley. "She taught me what Gouda cheese is and that you shouldn’t talk with your mouth full and spit on the sidewalk," Driver once told Broadway.com. In turn, the actor "told her about Rolling Stone and how it could be interesting and entertaining." 4. And Taught Him How To Stop "Dressing Like A 15-Year-Old"
"I just kept dressing like a 15-year-old until my wife was basically like, 'You know, you should wear long pants now. Maybe shorts are good for some people, but not you," he told Rolling Stone . "'And maybe you should get your toe looked at, 'cause, you know, it looks like a turtle shell.'" Even though the two are both actors (and not dancers), I imagine it was something akin to Save The Last Dance. In my mind at least. Driver and Tucker tied the knot in 2013 and reportedly had a "destination wedding," according to Us Weekly . The celebration was attended by Driver's Girls co-star Lena Dunham and her boyfriend Jack Antonoff. 7. And All. Their. Red. Carpet. Moments. Because count on Storm Troopers to make your relationship even more badass than it normally is.